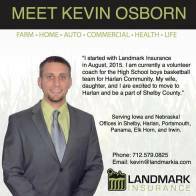 Have you met our newest agent, Kevin Osborn? Kevin will be meeting with customers at the bank branches not only in Shelby, but also Harlan, Portsmouth, Panama, Irwin, and Elk Horn. Kevin looks forward to working with you!